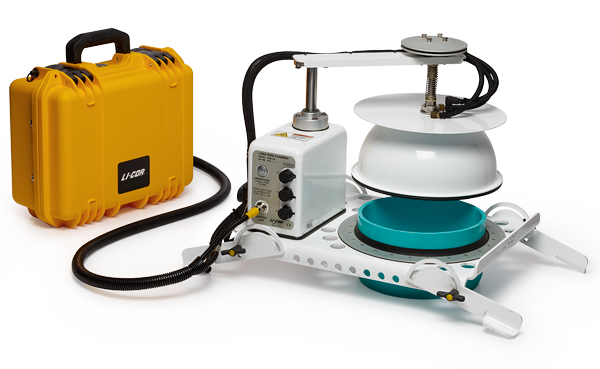 LI-COR soil gas flux solutions are based on extensive scientific research and testing with patented designs that ensure your survey, long-term, and multiplexed measurements are not confounded by the instrumentation itself. Advanced data analysis and visualization with SoilFluxPro™ Software allows you to adjust and analyze critical parameters to quickly get comprehensive results from your data. No other soil gas flux solutions give you the same level of proven hardware and advanced data processing needed to bring clarity to your measurements. LI-COR survey measurement solutions allow for the rapid surveying of emissions of your trace gases of interest. A variety of chambers and gas analyzer configurations support a wide range of gas species and applications. What makes LI-COR chambers different? 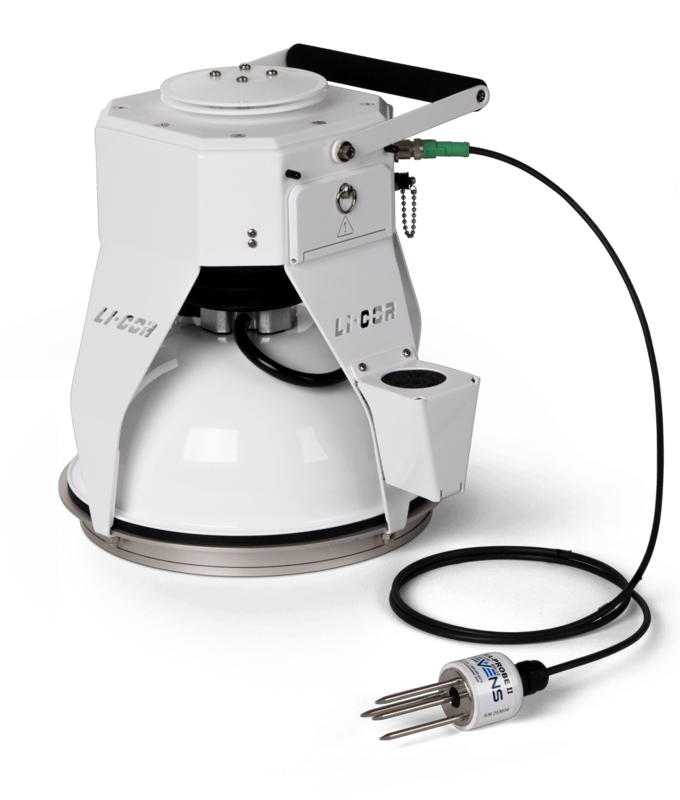 LI-COR soil gas flux solutions deliver proven hardware design and advanced data processing technology needed to bring clarity to your measurements. Air pressure inside a soil chamber must be equal to the ambient air pressure during a measurement. Any difference will affect the flux rate. Under windy conditions, chamber pressure drops as wind blows over the open end of a simple vent due to the Venturi effect, causing a mass flow of air from the soil into the chamber, leading to a significant overestimation of soil gas flux. All LI-COR soil chambers feature a patented pressure vent to maintain pressure equilibrium between the inside of the chamber and the ambient atmosphere. As air is forced into the vent by wind, the average flow rate drops. As the flow slows, most of the dynamic pressure is converted to static pressure, virtually eliminating the Venturi effect. The vent is radially symmetric to eliminate sensitivity to wind direction. Fig. 1. Cross section of pressure vent. For more information about the patented vent design, see Xu et.al. (2006). On maintaining pressure equilibrium between a soil CO2 flux chamber and ambient air. Journal of Geophysical Research 111 (DO8S10). DOI: 10.1029/2005JD006435. Fig. 2. The shape of the chamber and placement of the air inlet and outlet ensure that the air within the chamber is well-mixed. The shape of the chamber – a uniform bowl shape facilitates the even movement of air in the chamber. 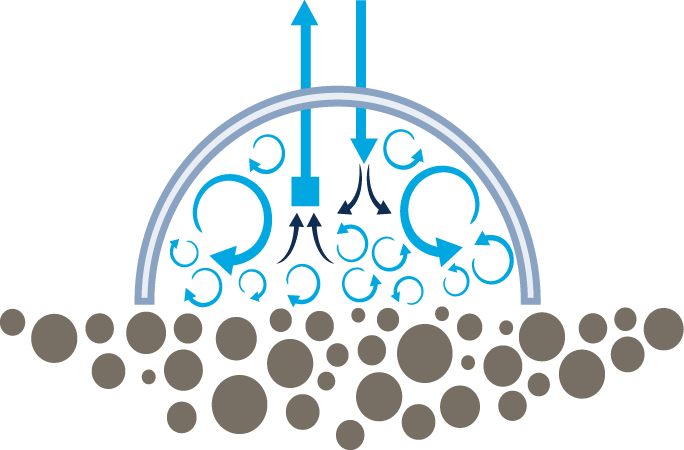 How air is introduced to the chamber – the air inlet position facilitates mixing. How air is removed from the chamber – the air outlet is positioned to draw mixed air. Capable of running autonomously for months and integrating up to 16 chambers at once, LI-COR long-term and multiplexed soil gas flux solutions are ideal for widely distributed measurements and assessment of temporal variation in gas fluxes. By integrating additional LI-COR or third-party gas analyzers, long-term and multiplexed systems also support fluxes of methane, isotopologues, and other gases. An inherent challenge in instrument design is reducing the extent to which the instrument itself impacts what is being measured. LI-COR chambers are designed to reduce the interference of the chamber with the natural respiration of the soil, producing accurate and consistent measurements. Accurate measurements of soil gas flux require that the gas concentration in the chamber is the same as the gas concentration in the air. However, increasing concentrations of gas in the chamber affects the gas’ diffusion gradient out of the soil, suppressing the efflux. The image to the right demonstrates this effect with CO2. Early studies often used a linear regression to determine gas flux, but this often results in significant underestimation of fluxes, particularly in porous soil. To account for this, LI-COR soil gas flux measurement systems use an exponential function to account for the altered diffusion gradient, estimating the flux at the time of chamber closing when gas concentration is closest to ambient level. Read more about how the flux equation is derived. Fig. 3. The CO2 concentration in the chamber begins to increase the moment the chamber closes. As a result, the flux begins to decrease, indicated by the slope (∂C'/∂t) that decreases with time. 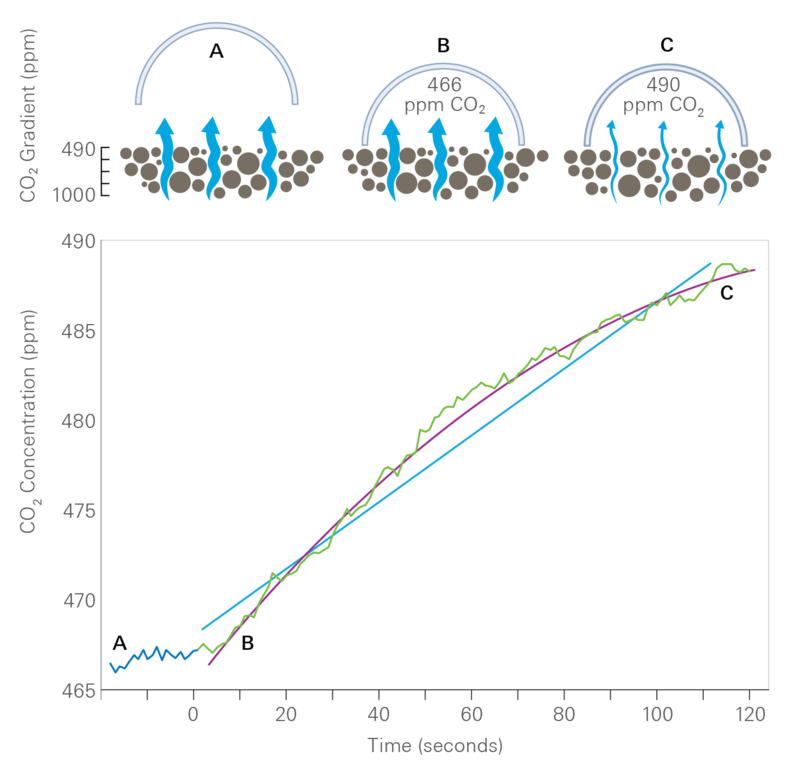 The blue line represents the pre-measurement CO2 concentration while the green line represents the concentration during the measurement. Fig. 4. All LI-COR chambers feature a gasket seal around the soil collar with a second gasket on the chamber bowl, minimizing disturbances to the soil collar when the chamber is placed or moved. Any physical process that disturbs soil can artificially impact the natural fluxes of gases from it. To address this, LI-COR chambers are designed to seal around collars that are placed in the soil before measurements are taken, meaning that the chambers are never placed directly on or disturb the soil being measured. Chambers are designed to be placed on the collar before an automated mechanism closes the chamber, minimizing pressure changes that may impact fluxes. The ultimate in data processing simplicity, SoilFluxPro is a powerful desktop application that allows you to analyze and visualize soil gas flux data from all LI-COR soil gas flux solutions. SoilFluxPro also allows for the computation of fluxes of trace gases and isotopologues using data imported from other analyzers. With SoilFluxPro software you can quickly and easily view, graph, edit, and analyze soil gas flux data, and view your flux data in the Google Earth™ mapping service. SoilFluxPro makes soil gas flux data analysis streamlined and straightforward. Quickly recompute datasets to test different parameters. Evaluate large datasets for quality assurance. Create a variety of visualizations. Compute summary statistics on datasets. Export data and results for publications and presentations. For survey measurements, long-term deployment, and integration into ecosystem-level gas exchange systems, LI-COR solutions offer durability, precision, and flexibility to fit your soil gas flux research needs.